Young, equipped with three different mic stands (stage left, stage right, center stage), entered via a revolving door to kick off his roughly 75-minute set with his latest album’s title track, “Losing Sleep.” On this and every other song the Tennessee native sang, whether he played his current hits like “Hangin’ On” or throwbacks like 2008’s “Voices,” Young’s singing gifts were apparent from his vocal runs to his silky smooth baritone. But some of Young’s most endearing and memorable moments during his set came when it was just his voice and acoustic guitar in the spotlight, thanks to what he played, sang and said in jest. He took a survey of all the single people in the crowd before saying “Y’all are screwed. This is a love song” and performed “Who I Am With You.” He mentioned how he used to play gigs at Mexican restaurant patios and funeral conventions and showed a cell phone video of 98.1 The Bull’s Michael Jordan dancing enthusiastically to a Taylor Swift song at a bar. Despite Young’s talent, hits, humor and likeability, the crowd peaked during returning co-headliner Cole Swindell’s hour-long set, and for good reason. Similar to his showing in 2016’s Red, White & Boom festivities, where he played before Florida Georgia Line, Swindell proved to be a hard act to follow, thanks to an ever-present smile, contagious enthusiasm, genuine appreciation and songs that tend to either veer toward the danceable, contemporary country vein or are serious ballads that strike a universal chord with the crowd. Swindell was in heavy promotional mode with the recent release of his third album “All Of It,” peppering in newer, upbeat tracks while showing off one of his newest, most personal ballads “Dad’s Old Number” just a few days from the five-year anniversary of his death. Swindell’s set also featured the event’s most festival-like moments when opening act Morgan Wallen came out to perform the “This Is How We Roll,” the Swindell-penned hit recorded by Florida Georgia Line. He also managed to salute the troops and first responders during a break in the break-up track “You Ain’t Worth The Whiskey,” resulting in Rupp erupting in a U.S.A. chant. While he did pop with excitement with songs like “Caught Up In The Country” and “These Are My People,” the highlight of the set came from a new song and duet with Falcon, an accomplished songwriter and performer in her own right, from his upcoming album. This was partly to do with the couples chemistry, the song’s craftsmanship and the fact they brought their 8-month old son Ryder on stage to adorably coo into the microphone. The evening got its start thanks to a couple of up-and-coming Morgans. Australian-born Morgan Evans came out with just a guitar but still did a serviceable job getting the crowd warmed up with feel-good numbers like “Kiss Somebody.” This was followed by Morgan Wallen, who offered more hard rock and Southern rock adorned with a denim vest and purposefully sculpted mullet. His brief set included a number one hit he wrote (Jason Aldean’s “You Made It Easy”) along his own tracks “Whiskey Glasses,” “Up Down” and a hard rock medley that showed off his solid backing band while incorporating songs by Linkin Park, Bon Jovi, Eagles and Kings of Leon. The St. Louis Blues host the Winnipeg Jets in the Western Conference first round with a 3-2 lead in the series. 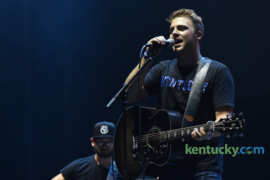 Red, White & Boom, presented by WBUL-FM 98.1 The Bull, brings three days of country music to Rupp Arena, Aug. 31 to Sept. 2. Headliners are Chris Young, Brad Paisley and Toby Keith, with stars such as Kane Brown, Luke Combs and others rounding out the 15-artist bill. Follow all of our coverage, here. It rained outside. But Red, White & Boom stayed dry and still rocked in Rupp. She’s the only female performer at Red, White and Boom. Her headlining tour begins soon. This country singer says performing in Lexington is ‘always fun.’ He’s here Friday. Weather won't matter for Red, White & Boom. The 2018 music fest is going inside.